Come to dance to NOD with Dor Mamalia & Dariusz Seweryn Nowak. 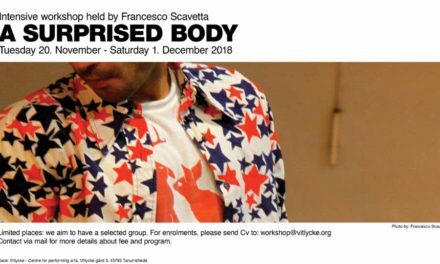 The workshop taught in collaboration by Dor Mamalia and Dariusz Nowak is suitable for advanced/professional dancers and physical performers who are interested in learning about their bodies and creative processes. Between both instructors, students are provided with an opportunity to train their contemporary technique whilst also being challenged in a performative manner. Each class is adapted to best suit each group of students usually beginning by stimulating and awakening the senses, muscles, and imagination and eventually resulting in a series of physically intense dance combinations. The class addresses and explores topics such as gravity, time, space, and one’s ability to find and utilise “anchors” within themselves and externally to become a more efficient mover. Furthermore, students can expect to spend time exploring the spine’s range of motion, the basics of movement through natural human gestures, and perhaps most importantly, to utilise their imagination and fantasy to innovate ways of executing movement unique to their bodies. The workshop requires full engagement into the exploration of both body and mind. The goal of the class is not to learn and repeat movement material, but rather to find comfort in the vulnerability required to research and execute movement specific to the individual student/artist.